"Only one can win it....!" I am a 29 year old software engineer from Belfast, Northern Ireland. I began playing poker three years ago - small stakes cash. For about six months, I continued to play cash, making very little profit. I then discovered tournaments and, boy, was I hooked! In my first few tournaments, I fared OK and reached a couple of final tables. I was soon making money (albeit at low stakes) and I soon knew that tournament play was the form of poker for me. So out I went, bought a couple of books and started taking my MTT play more seriously. By the summer of 2005, I was playing higher stakes tournaments. In July 2005, that magical week came (which I still consider to be my most enjoyable poker moment). I won $20,000 in two days! My bankroll had never been over $2,000 up until that point. Since then, it has been onwards and upwards with this year being my best so far - $74,000 in tournament winnings including over $20,000 alone this month and my biggest ever win of $15,000. Now, thanks to UK Poker News and Ladbrokes Poker, I will be attending the exclusive Ladbrokes Caribbean Poker Cruise in January! This freeroll tournament had 177 runners, with 10 places paid including an amazing $5,500 Ladbrokes Poker Cruise package for first place. I decided to play an aggressive style, knowing that only one can win it. I built a large stack very early on when a serial raiser duly raised me again. I had seen him do this with quite a few dodgy hands, so I pushed all-in. My JJ held up and I had an early double up. For the next couple of hours, I continued to build my stack without too much confrontation, stealing blinds and calling raises and hitting a few big hands. Before I knew it, I was at the final table and chip leader with over a quarter of the chips in play. I was determined to keep this lead and build on it, with the blinds now hurting the shorter stacks. With seven players left, I am dealt pocket queens which I raise. All fold except the guy second in chips - whom I just about have covered – and he pushes all-in! Wow, decision time! And it was tough. I am thinking "why would he push all in?" Surely, if he had a massive hand (AA or KK), he would slow-play to me or re-raise, but why all-in? 10 10. Now, knowing that there is only one huge prize, if I get all of this guy's chips, I will have an enormous chip lead with every chance of cleaning up, so I call. He turns over the mighty AA, they hold up and I am crippled. At that point, my friend turns to me and says "I can't believe you called that!" I turn to him in disgust and said "For **** sake! Only one can win this cruise!" In the next hand, I am on big blind with 94suited, another short stack minimum raises me, so I call to have a look. The flop is 245, he pushes all in (with 33), I call. My 4's hold up and I have doubled. I get busy again, stealing blinds, hit a couple of double ups, knock a couple of short stacks out and I am right back in it. Before I know it I am heads up with the guy who I had previously kindly donated most of my stack to when I had the pocket queens. 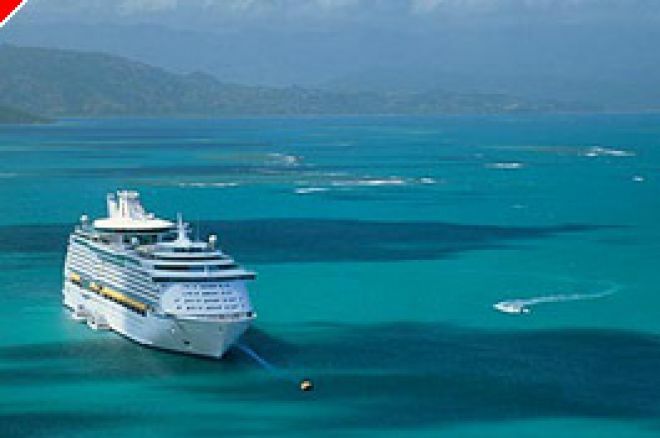 The second prize was a cruise weekly final seat worth $550, first was the full cruise package worth $5,500. I know what I was aiming for! I get busy right from the start playing very aggressively, easily taking the blinds. I build up a 2 to 1 chip advantage then a crunch hand developed. I raise AQ, he goes all in, with an instant call by me. He has 88 and they hold up. I am now down to 80,000 and he has 180,000. Then, a five minute break. I think "Not now!" The break gave me time to assess the situation. Blinds were now massive (6,000/3,000) and he had a huge chip advantage. I decide I've got to push and push hard and hope he doesn't get a hand. After the break, I raise almost every hand pre-flop and steal a couple of blinds. I then raise with 10 7 suited, he re-raises me and I call knowing that if I hit any of the flop, I have to push. hold!! He has only about 30,000 left now and pushes with 9 4, I call with two picture cards and win! Wooohoo!!!! I turned to my friend with a huge smile on my face and said "Told you! Only one can win it....!" The UK Poker News website is a great all-round informative site for any poker player. I often visit it while battling through the fields of a poker tournament. It provides an excellent one-stop shop for poker news and events from all around the world and provides details of numerous promotional events and freerolls with great prizes - definitely worth availing of - who knows, It could be you!! Ed note: UK Poker News' Cruise Freeroll may have been played but you can still join Jambo669 along with the Devilfish, Roy Brindley, et al by playing the numerous satellites on Ladbrokes Poker. Join through our links for a $500 bonus!